Get ready to experience techno in a whole new way. 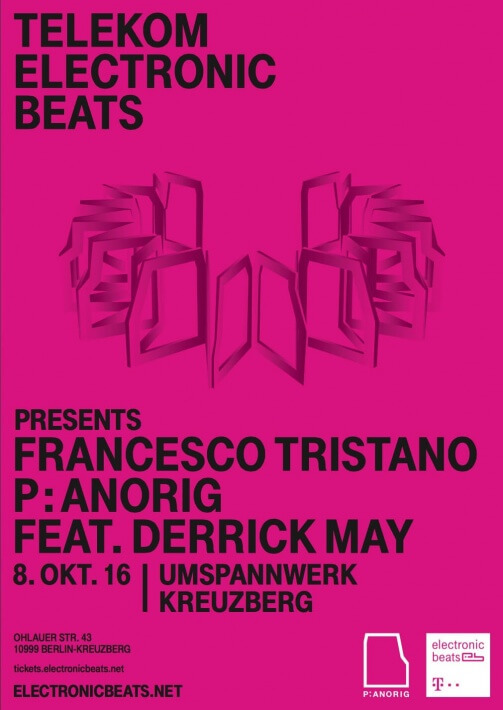 Telekom Electronic Beats is proud to present Francesco Tristano p:anorig feat. Derrick May at Berlin’s Umspannwerk Kreuzberg on October 8. A new concept from the hybrid electronic/classical pioneer, p:anorig reinvents Tristano’s live act as a kind of artistic installation complete with a combination of light, music, architecture and interior design that all speak through the language of minimalism. At the center of it all is an amazing centerpiece live performance rig—inspired by the shape of a grand piano—that holds all of Tristano’s keyboards and gear. Derrick May is featured here as guest artist in a rare live performance. The event is hosted by Electronic Beats.